Volume spread analysis (VSA) is the first of the three indicators in the VSA package. VSA supply/demand and no-demand/no-supply signals, that point many tops and bottoms in the market. It scans for signals of buying/selling by institutional and professional traders (smart money) or lack of activity in the current timeframe, and on the 2 timeframes above, marking them on the chart. These have an accuracy rate of signaling a market reversal around 75%-80%. Market strength (background) scanner. It scans the trend and the signals to determine if it’s a bullish, bearish or neutral market. Strictly non-repainting indicator: it doesn’t delete, move, or redraw any of the signals it draws. What the user sees in retrospect is what he’d see in real-time, and vice-versa. Each VSA signal has a different color, as shown in the titles below. 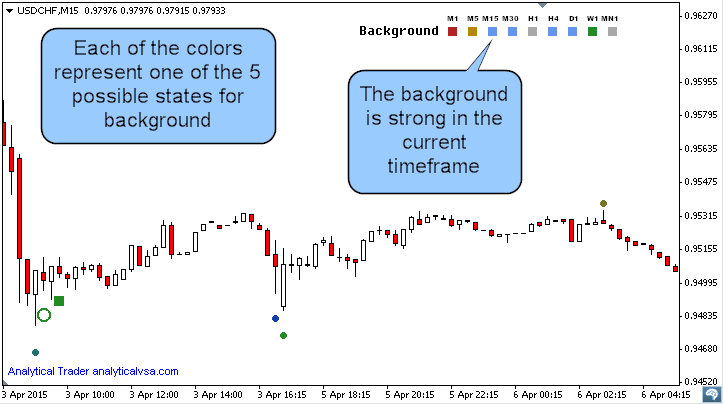 You can always hover the mouse over the signals in Metatrader, which will show you the description. Multi-timeframe signals use both the current and the above timeframe to improve accuracy, so they won’t necessarily fit the ones seen in the above timeframes. These signals are what determine a trend most of the times – enough of these Major Demand / Demand in a given price area, and the market is said to be going through an accumulation process, which is the smart money flowing into the market, taking long positions. Once this process is done, a sustained trend (bull market) can begin. The inverse process is called distribution. These signals can therefore be more than temporary strength/weakness in the market. They’re similar to the above signals, with the difference being mostly in the volumes – whereas the stronger signals above are accompanied by very high volumes, minor supply / minor demand signals have more modest volumes, but are nonetheless significant. Due to this fact, they usually only signal a temporary turn in the market and hardly have a lasting effect, unless of course, there was significant strength/weakness behind them. While the other signals show the smart money flowing into/out of the market, these show they’re not participating in the market at all. But if market is going up and the big traders aren’t participating, then they must not be interested for some reason! These also signal many market reversals due to that smart money inactivity; when a no-demand is overcame though, that becomes a bullish sign, since it means demand is coming into the market again, and the previous lack of demand was just temporary (vice-verse for no-supply). Institutional traders’ market bias can’t usually be seen in just 1 or 2 bars: the market needs to be analyzed in a longer perspective, to determine if they’re accumulating, distributing or buying into dips. And so, the supply and demand signals need to be analyzed together, rather than separately, to determine the bias in the market. . Another important factor to analyze is the trend, because the same signal on a ranging market may have a completely different meaning than in a trending market. This is the main filter to be used when entering in a trade: in most trading setups, for a long trade, the background should be either strong or very strong, or the current timeframe neutral and the above strong/very strong. For short trades, it should be weak/very weak or neutral and weak/very weak in the above timeframe. By default, it looks at 200 bars. Set to true to set GMT offset – If setting GMT offset manually, set this setting to true. It’s not necessary to set GMT offset manually if no warning message appears on the chart. The indicator automatically detects it and saves it for further use. Indicator Mode (for developers only) – If calling VSA from an expert/indicator, choose the option ‘EA/Indicator’. That will prevent conflicts with drawn objects (background). 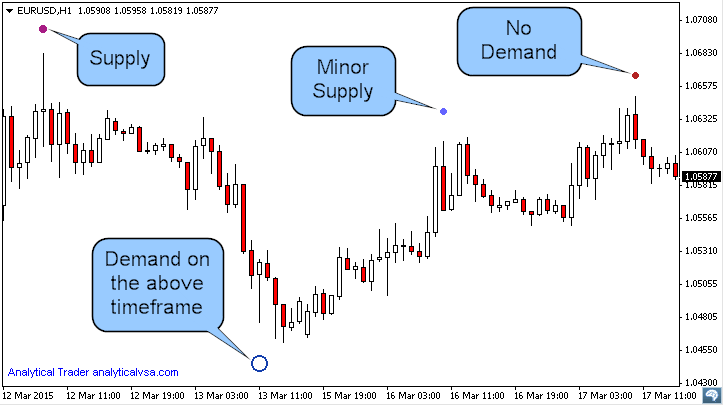 Leave ‘User’ when using the indicator normally in the chart.